Welcome! SAP’s strategy for industry brings 40+ years of know-how from classical ERP to the world of SAP S/4HANA and the Intelligent Enterprise. With SAP S/4HANA, we are building on the success of SAP Business Suite and SAP Simple Finance powered by SAP HANA with a new business suite called SAP S/4HANA. Natively re-designed and built on SAP HANA for massive simplifications in the data model; indices, aggregates and data redundancies are eliminated for a simplified data model and co-existence of all 25 SAP industries. Customers have the benefit of having *multiple industry solutions activated in parallel and being able to select and operate single functions and processes from an industry solution opening the door to new and innovative business models i.e. re-architecting industry capabilities. Note: More information related to S/4HANA Simplification categories please reference the latest update published on help.sap.com / Conversion & Upgrade Assets. **Restrictions do apply please always read the latest version of SAP S/4HANA restriction note and associated industry notes (SAP Support Portal). ***Refer SAP Roadmaps below. The Next Generation of Business Processes are already here, evolving SAP roadmaps along with the SAP Transformation Navigator help plan your journey to an intelligent enterprise (customer story link). It’s very difficult to separate machine learning use case from industry, the table below offers an extensive industry portfolio and catalog of publications to help. As we learnt in the blog Solving unique challenges in your business the path to transformation employs numerous tools to search and filter machine learning use case scenarios e.g. Leonardo Kaleidoscope) to help optimize, extend and transform your business simply identify the use case and drill down to learn more (below). Let’s not forget searching by industry doesn’t have to be by ‘industry’, your interests maybe discrete manufacturing and BYOM. 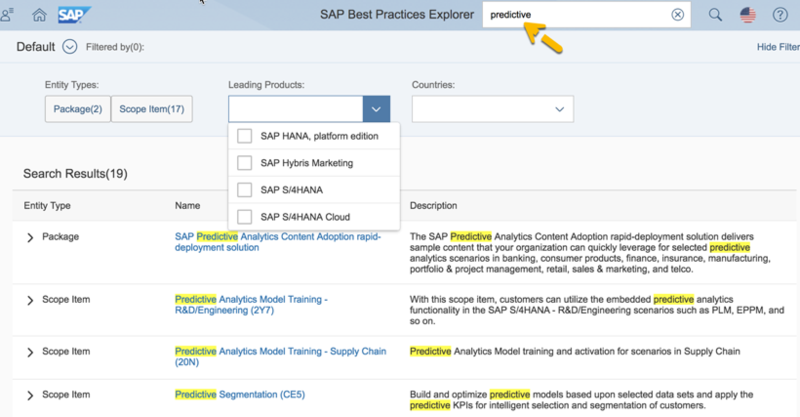 Simply search the SAP Best Practices Explorer using terms “machine learning” or “predictive” to learn about available scope items by product e.g SAP S/4HANA Cloud, on-premise etc…. Last but not least If you are interested in SAP Partners, search the SAP AppCenter for more information. 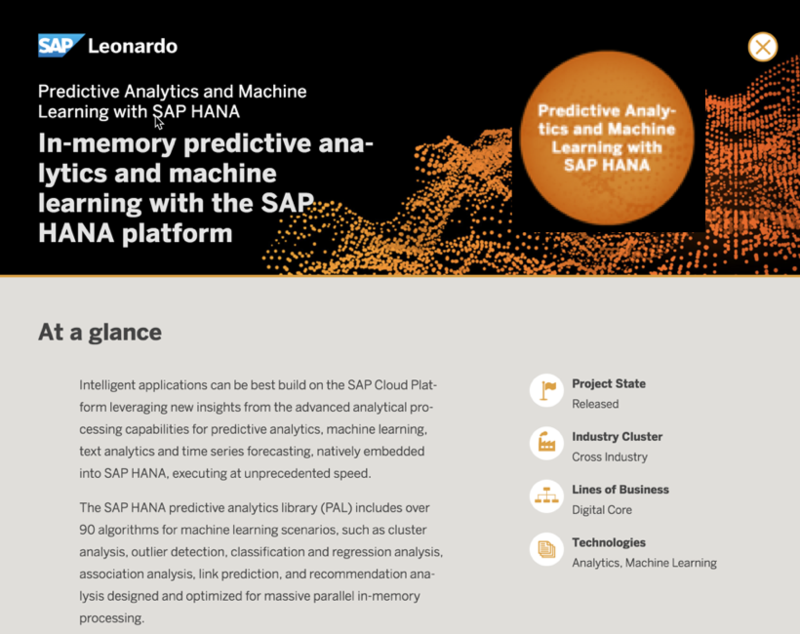 SAP Leonardo Internet of Things ; SAP Leonardo Machine Learning ; SAP Leonardo.